WHAT IS THE KINETIC CONTROL? 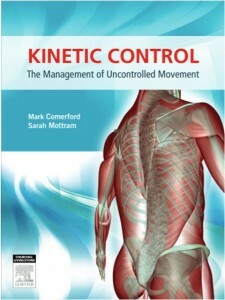 Kinetic Control is an international physiotherapist community set up by Mark Comerford and Sarah Mottram. It is based on the classification and management of the movement control system, where the focus is on movement control. Kinetic Control concept includes the assessment, management and the versatile retraining programs provided for classification system. WHO WILL BENEFIT KINETIC CONTROL SYSTEM? Kinetic control is worth trying if there are painful movements of the musculoskeletal system interfering daily activities. Uncontrolled movement exposes to many types of musculoskeletal ailments. HOW TO IMPLEMENT KINETIC CONTROL ASSESSMENT SYSTEM? Therapist chooses from comprehensive range of movement tests of those tests, which correlate best with the patient painful daily activities. Therapist observes the client’s ability to maintain the neutral position of the joint or area to be tested and at the same time moves the adjacent area or joint. The tests include all patient`s described pain provoked movement in order to seek the site and direction of uncontrolled movement. As an example if it is wanted to sort out the movement control of lumbar flexion, the movement tests in question can be sitting or standing bow as well as knee extension in sitting considering the benchmark range of movement. Uncontrolled movement attempts to round the lumbar spine, which in these tests should be avoided. The tests require a clean performance to maintain the neutral position of the lumbar spine. Movement should look easy, feels easy as well as achieve the benchmark range of movement. WHAT IS KINETIC CONTROL TRAINING? Kinetic Control exercises are simple, easy to implement at home exercises. The exercises are performed with great precision, against one’s body and limb resistance, without pain and fatigue. Training is normally carried out 2 times per day. Training session takes only for a few minutes. HOW KINETIC CONTROL TRAINING IS DIFFERENT FROM THE NORMAL GYM TRAINING? Gym training is done with machines, and the load is usually quite heavy because often the goal is to increase muscle strength. Kinetic Control exercises are done without any machines (excluding wall, chair, etc. ), low resistance, keeping the joint or area trained in neutral position, without even a small movement or compensation. The aim is to improve the movement control of joint or area by enhancing the threshold of poorly activated muscle. The aim is also to achieve the active range of motion, which is almost as close as to passive range of movement. With low-load training, we can wake up the poorly activated muscles or the muscles which can not maintain activation (provide support) for long enough. If heavy load is applied, superficial and dominant overactive muscles will bring in. Strength training does not improve movement control in low load activities and superficial muscles overactivity will be easily maintained. In pain the so-called slow motor units (deep muscles) are suffering more than fast motor units (superficial muscles). Thus, for example, typically in low back disorders the activation is late for deep muscles which stabilize the spine, and therefore the main objective of the training is to enhance the activation of these deep muscles and not strengthen for example the superficial abdominal muscles. Strength training increases muscle size whereas Kinetic Control training aim is to improve the threshold of muscle activation and enhance muscle co-operation. Ideally, these two ideas work together. HOW KINETIC CONTROL TRAINING IS DIFFERENT FROM FUNCTIONAL TRAINING? If the motion is not controlled in functional training (or in daily activities) movement is taking place from the path at least resistance. Therefore the joint is subjected to too heavy stress and strain exposed to tissue damaged. The aim of Kinetic Control training is to find the weak link (site and direction) and fix it. In that way it is safer to move forward to functional training or control daily activities. WHAT ARE KINETIC CONTROL MODULAR COURSES? Kinetic Control modular courses consist of the neck, shoulder, upper limb, thoracic spine, lumbar spine, pelvis, hip and lower leg. Each section includes 2-4 days of sustainable training session. In the courses systematic movement tests and retraining strategies are taking place both in theory and in practise in terms of patient pain and disability. Education also provides extensive physical therapy information related to the anatomy and the different kind of muscle activation, activation pattern and sequencing of activation. Anatomical structures are located and manual examination of the joints, as well as treatment techniques are also discussed. The program also includes a high-quality printed materials.